Trench. Scarf (similar here, here and here). Denim: Current/Elliott. Flat: Chanel (also love these). Sunglasses. Lips: Stila ‘Beso’. Bag: Chanel. Sweater: Base Mark (also love this one). Top: Old (similar). Beautiful fall look. 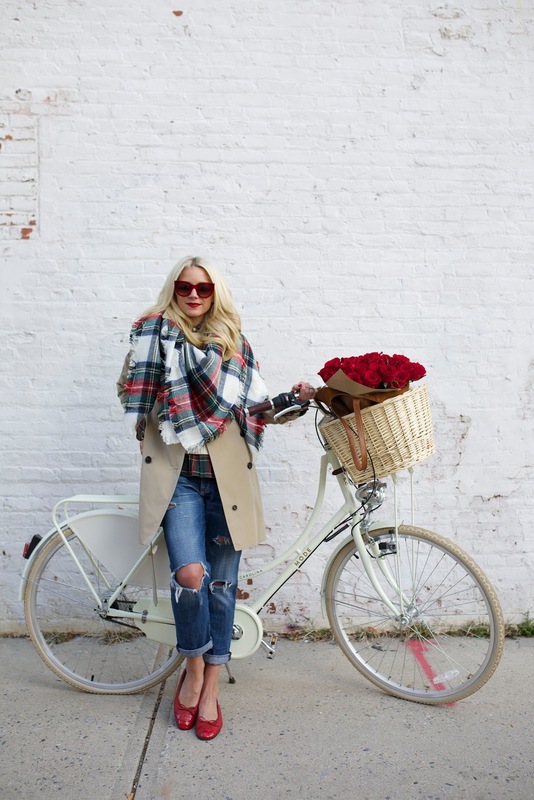 Love your trench and scarf! Beautiful pics, Love the jeans! I'm loving all the pops of red in this look – gorgeous! 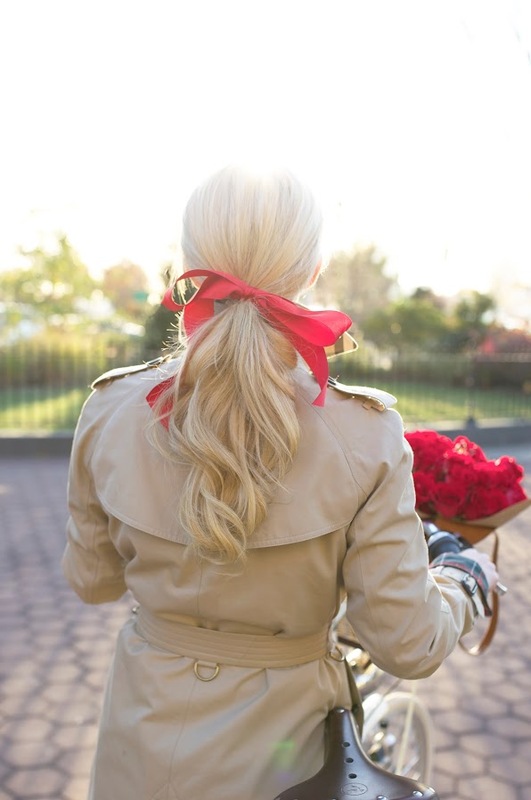 Fabulous scarf, love the bow in your hair and this trench is a timeless piece! Love it you wear two kind of plaids! Love your outfit and the flowers! This look is absolutely adorable!!! I love this! I have a white bike, too. Thinking it might be time to step up my plaid game. Perfect fall look! The roses are beautiful! Totally obsessed with all of the plaid in this look! Super cute outfit. gorgeous photos, love the beautiful scarf! Oh love it. i think red flowers increase the beauty of your dress which match with your shoe. You look so cute in all of the plaid with the bike! Such a fun look! Love it! Beautiful color scheme. This scarf is fantastic! Love everything about your look; so polished! This is the perfect fall outfit! Absolutely gorgeous! Love this look! That hair bow is super cute! Such beautiful photos, Blair! I love the pops of red throughout the look, making the entire look scream fall, especially with that fab scarf! I specially like your sunglasses, are so beautiful. What cool combo, I love this look! I love the simple addition of the ribbon in your hair! I love this so much it is so beautiful ! 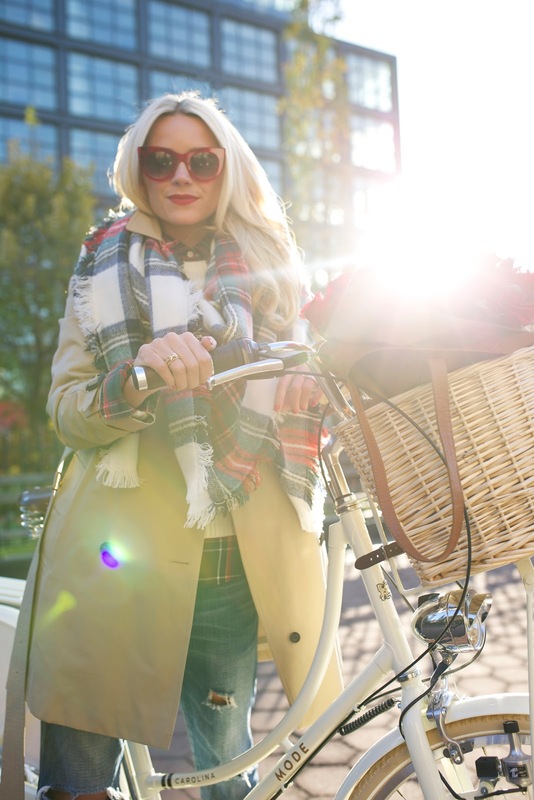 Plaid is the greatest and double plaid is even more amazing plus it looks like so much fun going for a bike ride in the amazing sunshine ! You are just perfect! This is so pretty! This is such a cute post, your outfit is adorable. Love the bike! and gorgeous light! Used promo code TGWINTER for $25 off every $75 I spent!! Such an adorable look, loving the scarf! Those flats are so adorable. Mixing a plaid shirt and plaid scarf is now officially on my to-do list. Cute look! I love the scarf and the ribbon in your hair! I LOVE your outfit & your chanel flats are super cute!! All of the red accents are amazing. Such a great color on you! Not to mention, the lighting is just fab!! This look is adorable! I really love the bursts of red, the bag is gorgeous! – Such a good outfit, classic use of layering, which is really well done! What a gorgeous laid-back look! Absolutely love the maxi scarf! 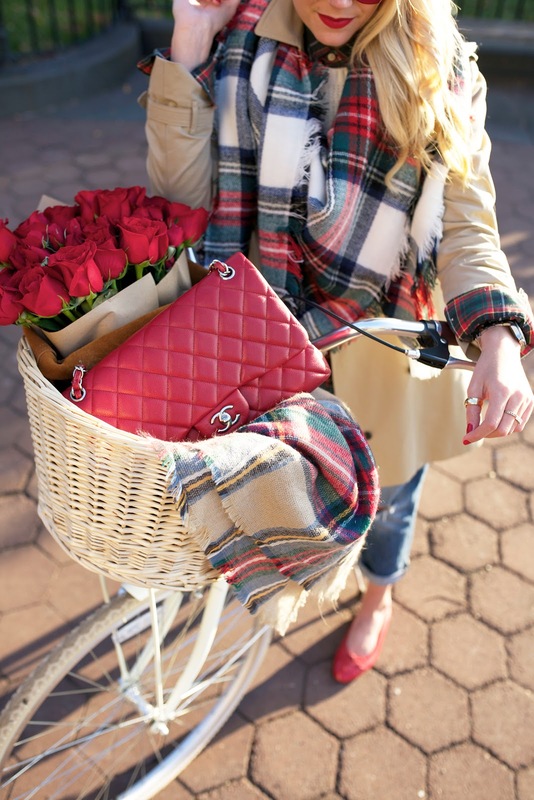 I love all of the plaid and red in this outfit! So festive. Such a lovely look! Love how yo0u put yyour hair in such a cute ribbon! Beautiful look once again! Love your beautiful photos and outfit! Perfect for a ride! I absolutely adore your outfit and your mix of plaid, tan, and red! Everything works in these photos. And the lighting is perfect. So beautiful, thank you! it makes my day, its very helpful for me..
very helpfull post, its intresting….!!! !